I wrote about another "Pilots" team just two days ago, the single-A Tigers affiliate from Clinton, Iowa. 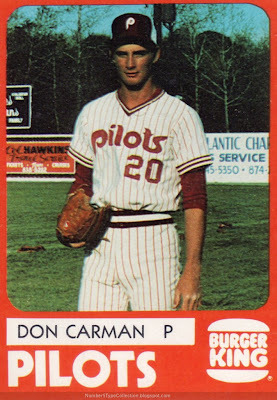 You can guess by the stylized "P" that today's Pilots served in the Phillies farm system, following a long line of local teams that played for the Dodgers, Expos, Senators, A's, Astros, or independently from 1900-1970. 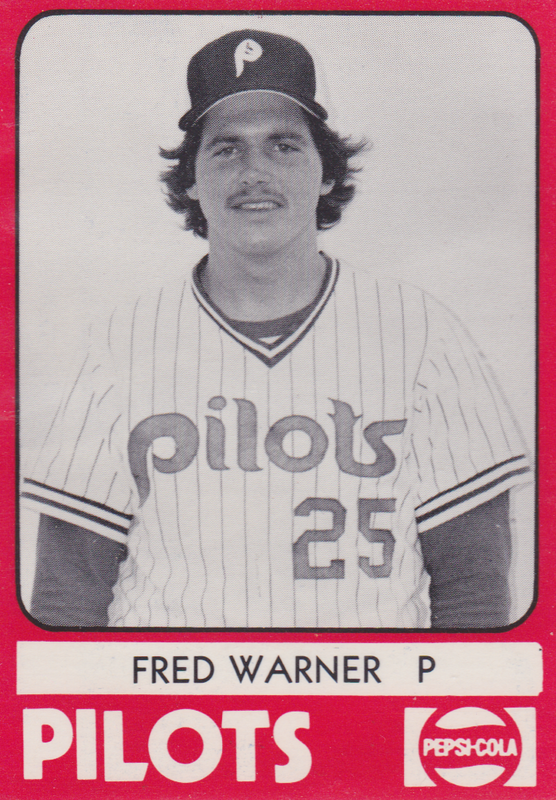 Unlike the short-lived flame-outs of earlier teams, these Peninsula Pilots found a long string of success in the 1980s, finishing with the Carolina League's best record 4 times in 7 years. 1980 saw them go an amazing 100-40, a feat that earned them #74 in MiLB's top 100 seasons. 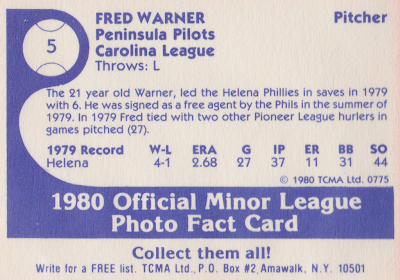 Note that Warner and Carman's cards share the same red-bordered design, since the Pilots issued two sets that year, one in color and another in black-and-white. My hunch is that the team's amazing first half (51-19) excited fans so much that they sold out of the black-and-white sets and team marketers decided to splurge on color for the rest of the season. That's one more #5 for me! Value: Singles from this set cost a dollar or two. The black-and-white set's currently on eBay for ~$1 per card.